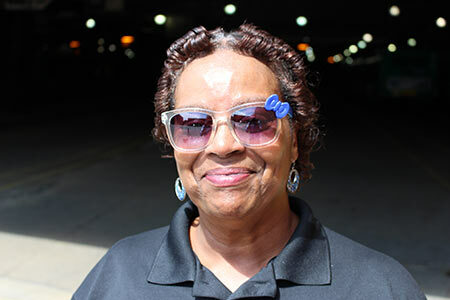 MCTS Driver Willie Nash is known for her fancy eyewear, but it’s something she did to help a passenger's feet that is getting her praise. "I remember the rain was so high, it was like flood water that day. This young man stepped on my bus looking sad, but when he got off, that is what caught my attention," Willie said as she talked about what took place one rainy day on her Route 14 bus. "I happened to look down and he was completely barefoot and his pants were up his legs a bit, his coat was worn and torn. He was just in despair, bad. He looked like he didn’t care any more." As the stranger stepped off her bus barefoot, Willie felt she had to do something. "Dignity, he needed some kind of dignity. I wanted to give it to him," Willie said. So she handed the man a $20 bill from her purse so he could buy a pair of shoes. "I couldn't let him walk away without something. I wanted him to have some shoes at least. I offered him $20 to go buy some shoes and he was kind of excited. He knew the Wal-Mart was down the street and he said 'ma'am, I’m going to go right there right now. Thank you so much,'" Willie recalled. Willie's story was featured on WTMJ 4 and she talked with us about it below. Thank you, Willie, for being a shining example of MCTS Excellence.